REMOTE ACCESS SOFTWARE: Still needed after all these years? REMOTE ACCESS SOFTWARE:<br>Still needed after all these years? What if they published a software program'and nobody cared? That hasn't happened in the category of remote access software yet, but some users think it will. About a dozen years after the category arrived on the scene, the once-booming market has slowed, observers say, and now is dominated by two or three vendors. What happened? Some would say the growth disappeared in a cloud: an Internet cloud, to be precise. We're at the brink of being a networked nation'a wired world'and many tasks formerly restricted to special software can be done with the click of a mouse over the Internet, which in many network schematics is depicted as an amorphous cloud. Microsoft Corp. has built remote-access features into its Outlook program, letting users configure the software to retrieve IP e-mail from virtually any accessible server via an Internet connection. The company also has given the Windows operating system stronger file transfer capabilities than before, making it possible for a user to connect with a remote computer and shift files via a dial-up or Internet connection. 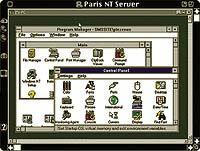 This was another prime application for remote access software in days gone by. And the latest version of Microsoft's Office suite, Office 2000, debuted in June with the promise of 'webified' applications that can share files over the Internet and let users work collaboratively'tasks that come mighty close to remote-control computing. The speed and quality of these applications might not match those of remote access software yet, but clearly, a trend is afoot. File transfer. Remote workers want to exchange and update files from their computers to an office PC or network. Some programs, such as LapLink Professional, offer their own approaches to file transfer, and others rely on standards such as Telnet or FTP, the File Transfer Protocol. Determine which method works best for you remotely and which is supported by your host system. Remote control. Does the software you want to buy let you operate a remote PC as if you were there? Some programs, such as pcAnywhere and Carbon Copy 32, offer this as a primary function. Voice over data. Can you chat with someone at the other end'a co-worker, someone in tech support'while you're logged in remotely? This can be an important feature if you're on the road with only one telephone line available. Security. What level of encryption does the software have? The higher the standard, the more secure your data will be, although there may be some speed tradeoffs in communications. Internet-ready. Can your program work over a dial-up or other Internet connection, and can it work with any firewalls in your organization? Add to this the current mania for enterprise management tools from companies such as Tivoli Systems Inc. and Computer Associates International Inc., and you've got a brave new world facing publishers of remote access software. But it's not time to count out these programs yet, observers and marketers say. For one thing, not everyone uses the latest version of Windows or Office. And as the computing world evolves, the nature of remote access software is evolving, too'into a tool by which information technology departments can provide tech support virtually anywhere, or control the functions of a remote computer. In tasks such as these, remote access software far outpaces any other solution, its promoters insist. For example, Compaq's Greco said that when a user tries to open a PowerPoint file on a remote system using Outlook or a Web access system, performance plummets. Theresa Nozick, an industry analyst with Mobile Insights of Mountain View, Calif., said, 'There are lots of interesting Net-based solutions out there now which allow us to access our data, in many cases for free. But for enterprise users, the biggest issue is security. [Systems managers] seem to favor customized remote access software solutions to ensure the integrity of the data. $139 for a twin pack. Adapting remote access software to today's scene requires a heavy emphasis on remote support and on Internet access, said Charles LaForge, senior product manager at Symantec Corp.'s remote software unit in Melville, N.Y. The company's pcAnywhere, now in its ninth version, has changed with the times, he said. 'What pcAnywhere provides is the ability to get to that PC at the office to transfer files, synchronize files, remotely run applications,' LaForge said. 'It's also a great tool at the office to connect to people working at home or in a hotel room. When they call back and say, 'I'm having problems with my config files,' or 'My PC isn't working properly,' the help desk can call the user and troubleshoot the problem directly. 'People are using the product today who have a need to dial into a specific system, or we have people using it for small business to kick off a nightly batch process,' LaForge said. So, if there's still life in these products, what's new? One capability of the newest version of pcAnywhere is to make remote access easy for an IT support team. The company claims the new software lets IT managers preconfigure installation and run-time settings as part of the remote installation procedure. Called a Host Administrator, the new utility also lets administrators view the security log on each machine. That emphasis on remote support isn't unique to Symantec. At Compaq's services unit, Greco said that one key application could be filed under the category of 'Computer maker, heal thyself''or at least, heal thy users. Compaq bundles a customized Carbon Copy client on each PC it sells, he said. The software is used by the company's tech support center to reach customers who are having technical difficulties. The company achieves a 98 percent first-call completion rate, Greco said. Compaq's experience with remote access software that is used to solve technical hassles also has implications for other organizations, he said. Complicating the remote access situation are Internet firewalls and virtual private networks, which are growing in popularity among large organizations. Ray Suarez, a product marketing manager with Axent Technologies Inc. of Rockville, Md., said the reason many organizations use a firewall is simple: security. Getting through the firewall can be done using one of two Axent products, Suarez said. First is RaptorMobile software, a $99 product that works with Axent's Raptor firewall software to let authorized remote users gain access to the network. The other is the company's PowerVPN product, a site-licensed service that combines Internet access to an organization's main computing hub with secured and authenticated access. Axent Technologies Inc.'s Power VPN uses multiple levels of encryption to set up a secure communications path; it works over a dial-up or Internet connection. By using a product such as PowerVPN, he said, users can control the security end of communications while allowing others to handle the networking hassles. 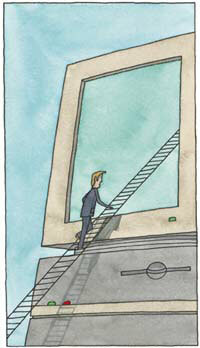 And what is the future for remote access software? You can expect more consolidation in the market, analyst Nozick said, and probably more efforts by Microsoft to incorporate remote features into its products. Bob Beech, a senior vice president at Traveling Software Inc., maker of LapLink Professional, said, having communications options for remote file transfers will remain important. Instead of being written off, then, the history of remote access software may be entering a new phase. can be reached via e-mail at mark@kellner2000.com.